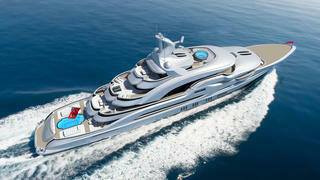 Oceanco has revealed its latest concept, a 90 metre superyacht called Sunny Memories that was designed by Dennis Ingemansson. Featuring naval architecture by Oceanco and BMT Nigel Gee, Sunny Memories would include a steel hull and aluminium superstructure, with a 15 metre beam. Based on the proven 90 metre Oceanco platform, Sunny Memories would feature floor-to-ceiling tinted glazing in the central superstructure. A low and sleek stern area includes a beach club that centres around a swimming pool. The main deck would be split between six double guest staterooms, a dining area and a saloon that could be converted into a disco at night. The upper two decks are reserved for the owner, with a private whirlpool on the foredeck and his and hers ensuite washrooms leading off from the master cabin. Further owner's amenities can be found on the top deck, which would comprise a private office, gym and massage room. 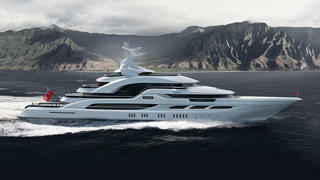 Power would come from a pair of 4,830hp MTU 20V 4000M 73L engines for a top speed of 18.5 knots, while the fuel capacity of 280,000 litres should allow for long-range exploration.